I think I’m one of those lucky ones who get 7-8 hours of sleep everyday. I make sure I get enough or else I get cranky (lack of) or headaches (oversleeping). When I was still in university, “normal” sleep is 4-5 hours daily, and add schoolwork madness into that. I lost a lot of weight and was generally unhealthy. Now that I can afford a healthy amount of sleep, I’m feeling much better and of course, healthier both in mind and body. Susie – I can imagine why sleep would be of huge interest to you – I’m already dreading the loss of my precious 10 hours a night when we decide to have kids. Co-sleeping sounds like a great strategy – thanks for sharing! Charlotte – I can’t imagine going back to my “normal” 5-6 hours of sleep a night from my old job. I’m certain you feel so much better now – and are healthier for it as well! Thanks for the article, I really enjoyed it! A lot of people certainly do take sleep for granted, and it serves them poorly in the long run. I am currently in an accelerated and very challenging nursing program, hit the gym 5 times a week, have a 5-year-old son, and my husband is a full-time student as well. Over this past semester I dedicated myself to getting 8 hours of sleep EVERY night, regardless of how much studying or housework I still wanted to do. It turned out to be the best decision I made. I ended up much less stressed than most of my classmates and pulled straight A’s, along with hitting new PRs at CrossFit and feeling great in general. I relate much of my successes these past few months to the additional sleep I’ve been getting on a regular basis. On a second note, can we get the references for the article? I love to look up the original sources and see what else I can learn from them. Thanks, and keep up the strong work! Thanks for your kind words, and I’m glad you found the article helpful. To be honest, I don’t have a comprehensive list of references for specific articles I write (though I probably should). I piece together various perspectives and studies I read into a (hopefully) cohesive thought process, but it’s made up of a huge number of tiny pieces. I would recommend some quality time with Google Scholar; some useful search terms might be “sleep deprivation”, “growth hormone”, “interleukin-6”, and “cognitive performance”. (Use combinations of these and other related terms.) If there’s a very specific aspect that you can’t find a study on, shoot me another comment and I’ll see if I can dig one up for you. Great article Dallas! I always make sure I get at least 9 hours of sleep a night or I get very cranky. Personally I’ve never understood why people are sleep-deprived. The way I see it, sleep is one of the few things in life that is completely free! After doing Paleo for about a year, I’m about to start my very first Whole 30 this coming Monday. Here’s the problem: I have sleep issues. Sometimes I don’t fall asleep until the early morning and then I’m exhausted. Sometimes I fall asleep right away and wake up around 3am and then feel exhausted (and no, this wasn’t a case of waking up for a while and then falling back asleep again – I’d just be up and then feel like death at work). Thanks to Paleohacks, I’ve learned that a teaspoon of honey and some vitamin D (one 5,000 mg pill for now) before going to bed works great. However, I can’t have honey during my Whole 30! I’ve so far tried substituting a banana (didn’t work) and a few nights later tried a date (similar carbs/sugar to honey – didn’t work). I haven’t experimented with Magnesium or Melatonin for various reasons. Mostly, I’m worried that my system would get use to one dose, then I’d have to increase the dose, I’d get used to that, increase the dose, etc., etc. @DJ: While there’s various thoughts about melatonin supplementation, magnesium supplementation doesn’t harbor the same concerns, nor do you develop a “tolerance.” The body makes melatonin, so some suggest supplementing it throws off your body’s own production. Supplementation with magnesium doesn’t cause your body to retain less magnesium or absorb less, and it’s worked exceptionally well for many of our clients with sleep issues. You can try a citrate form (start with 2 teaspoons mixed into water before bed each night), or an Epsom salt bath before bed (2 cups of salts in your bath water, soak for 15-20 minutes). See if that helps. Also, move your coffee consumption to earlier in the day (end at 10 AM or so) – you’d be surprised how much coffee messes with sleep, even 8 hours later. Bump your “no blue light” thing back to at least 90 minutes before bed – practice a new winding town routine that doesn’t include computer, TV or phone. I’d recommend against sugar before bedtime – depending on your health status and degree of lingering insulin resistance, that may precipitate the mid-night wake-up. (And sorry to say, honey is out for your Whole30.) Try the magnesium and consider getting cortisol levels tested, as that’s likely the culprit. Wow, Melissa, thank you so much for the thorough reply. I know from your Whole 30 information packet that you guys are cool with magnesium but I kind of overlooked that until now. Due to your and some others’ recommendations, I have a supply from Amazon on the way! I hope it works as today I start my very first Whole 30! I never thought my cortisol might be a problem. I might have to look into that, too. Thanks again. I know how busy you are. I really appreciate the response. Having been an insomniac my whole life since I was 12, I’ve tried everything. Consistency makes the difference, as well as not being too uptight about it. I can do everything right and be up until 4am, and do everything wrong and fall asleep in minutes. The best thing for me has been to just roll with the punches, and give myself time in the morning. The freedom to wake up later actually makes it easier for me to fall asleep than going to bed early, so I try to keep my mornings free. Excellent article, Dallas. Wish I’d seen this last year when it came out. Probably would have saved me some sleepless nights. Thanks for sharing that SciAm article. 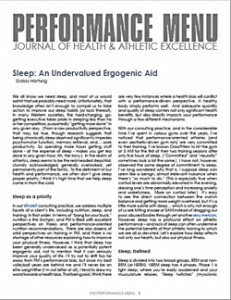 It was research like that that led me to start thinking differently about sleep in the first place. I’m glad that it has been helpful for you. Thanks for stopping by! Thanks so much for sharing the article! I’ve been following a diet closer to Paleo/Primal (haven’t tackled the Whole30 yet, but stopped using sugar and artificial sweeteners and cut WAY back on whole grains). I just finished It Starts With Food a few weeks ago, and I’m planning to do the Whole30 with a friend beginning 1 Sept. I’ve also been getting more sleep, and I am starting to feel like Superwoman! You guys rock! After being diagnosed with overtraining, I finally started taking my sleep seriously, and now I refuse to get any less than 8 hours per night. I teach fitness classes in the evening, which sometimes can get you wired, instead of tired. So, every night I take 3 things 1) magnesium (I take the unsweetened version of Natural Calm); 2) 2 mg of melatonin; 3) chamomile tea (steeped with a cover). I sleep like a champ on most nights. Since I go to bed at 8 PM, I wear a sleep mask and sometimes ear plugs.